Milk and tea, a match made in heaven. 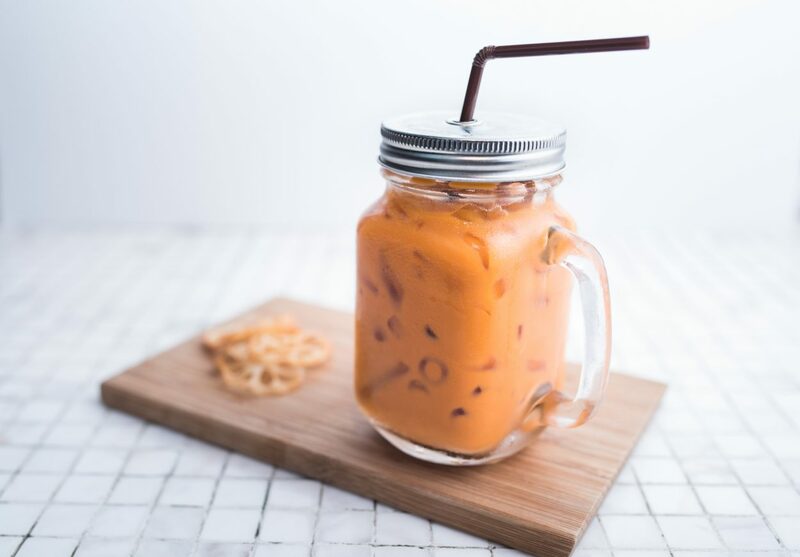 In this brief guide we’re going to take you through what the essence of milk tea is and the different types and flavours you can try, with a few recipes that are very easy to make at home. You’re going to kick yourself. Milk tea is simply tea with milk! That includes many popular tea drinks, from a spiced chai to your Starbucks green tea latte – and let’s not forget the traditional English Breakfast tea served with a dash of milk. 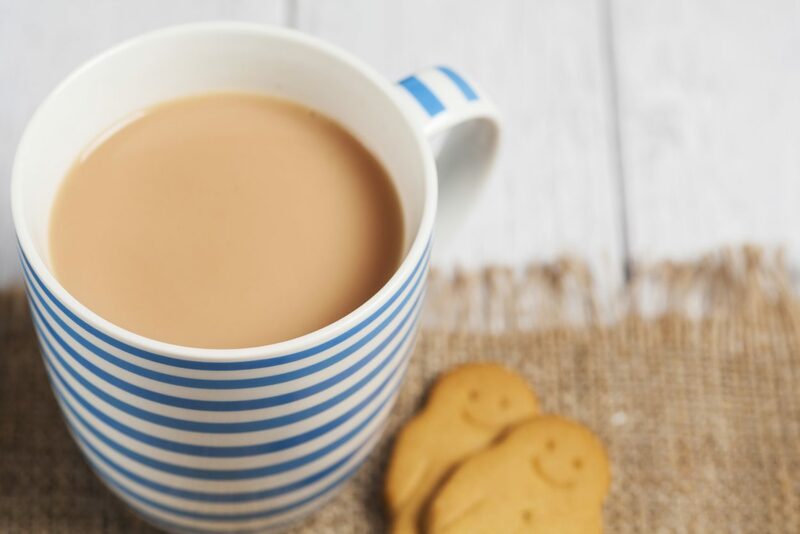 By adding milk to your tea, you enhance a richer, creamier flavour while masking any bitterness. It’s typically added to black tea but as you’ll see below, all manner of tea types can be whipped up into milk tea beverages. The amount of milk you add (and the type, if you wish to avoid dairy) is completely up to you, it’s down to personal taste. Our recipes below will create a balanced milk tea, but you can easily make it stronger or weaker to taste. Then, depending on the recipe you pick, you may also need these. Flavourings – dried herbs, spices, flowers, oils, essence etc. The classic tea we consume with milk is the English Breakfast tea. This bold Chinese, Indian or Kenyan black tea is often consumed with a splash of milk and a few sugar cubes. Here’s how to brew an English Breakfast tea with milk. Boil your water in a kettle or on the stove. Once boiled, pour the very hot water on top of the tea bag or loose leaf in your teacup. Let it infuse for approximately 3 minutes then remove the tea bag or strain out the tea leaves. Add a small splash of milk until it is a warm milky brown colour (usually a few tablespoons of milk). Sip slowly with your breakfast. Our top 12 recipes are personal favourites and popular choices across the world, from the Taiwanese Boba milk tea to the unusual Hong Kong coffee milk tea. Below you can find a brief description of what to expect and a recipe to make it for yourself. The traditional recipe is Taiwanese, created in the 1980s. It’s more commonly known as bubble tea in the UK and USA, thanks to the ‘boba’ or bubbles you can see in the tea. 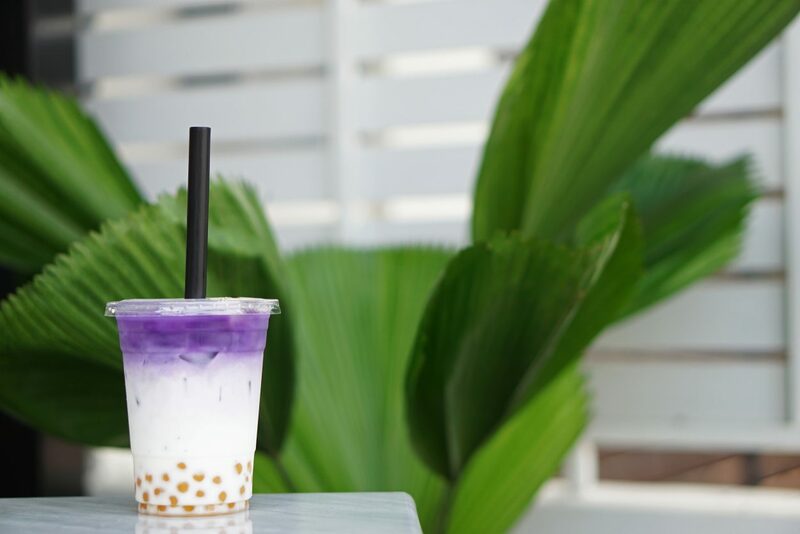 It’s typically made with sweetened or condensed milk, brewed tea, and tapioca jelly pearls. You can drink it hot but usually you’ll find it’s sold cold or iced. Flavour-wise, it tastes sweet and milky. Some bubble teas have very little tea in them, while others have a considerable amount. Regardless, tea is not the main flavour in this drink. It feels creamy and sweet with fruity/juicy flavours when you bite into the bubbles at the bottom. For 1 cup of bubble tea, brew 2 strong black tea bags (4g of loose leaf) in freshly boiled water. Leave to chill in the fridge while you prepare the tapioca balls. Boil a ¼ cup of quick-cooking tapioca pearls in 1 cup of water on the stove until they float to the top. Drain and rinse the pearls. Add the pearls and ice to your mug or cup, then pour in your tea. Add milk to taste (usually a few tablespoons). Jasmine tea usually is made with green or white tea leaves, infused with the petals and oils of jasmine flowers. It’s light, refreshing, floral and not a tea you’d immediately think of having with milk! By adding milk to your jasmine green tea, you’ll find that the grassy and slightly astringent nature of the green tea is replaced with a rich creaminess. The flavour will be mellow and naturally sweet, with a smooth honey jasmine note. As jasmine is quite a light, gentle green tea, you should brew it for longer than you normally would to ensure the jasmine will stand up against the milk. Brew your cup of jasmine green tea (a jasmine maofeng is a great choice) with 80°C water. As we want a stronger brew, using 3g or 4g of leaves per cup instead of the usual 2g is fine. Let it brew to a strong, aromatic flavour. Add milk and sugar to taste (raw cane sugar is a good choice, as it has a rich flavour). Roots and root vegetables are rarely tea ingredients, perhaps with the exception of ginger. Yet taro, a sweet and nutty root vegetable primarily from South-East Asia, makes delicious milk tea. Once made into a milk tea (with or without the Taiwanese Buba bubbles) it’s sweet, creamy and nutty with a brilliant purple colour. Most tea shops will use powdered taro to make their taro milk tea (simply add the powder to milk and sugar like a milkshake), but we’ve found a recipe that uses the real taro root. You need to use cooked taro for this recipe. You could boil it or roast it with honey, to soften the root. Once softened and cool, blend it with milk until smooth. For every 1 cup of taro, use 3 cups of milk. You can also find tinned taro, which makes your job easier – but it does mean that there may be added sugars. We recommend sweetening your taro milk tea with honey, rather than sugar to play up the warm and nutty notes of the taro. Green tea goes very well with milk, despite the common practice of only drinking black tea with milk. Nutty, sweet and mellow green teas in particular go well with milk, so we recommend pan-fired Chinese green teas. You can also use milk to make your matcha green tea instead of water, for a creamier drink. There’s some evidence that drinking green tea with milk can diminish the health benefits of green tea, but it’s certainly not bad for you when drank in moderation like any other tea. Our favourite way to drink green tea with milk is in the form of a green tea latte. Prepare your matcha in the same way as usual but use half milk and half water. So, sift your serving into your matcha cup, add half the hot (not boiling) water you’d usually use, then whisk together. Meanwhile, gently heat milk on the stove, stirring regularly to stop it splitting. You can add sugar or sweetener to the milk at this stage. Once it’s hot give it a thorough whisk so it’s frothy – dairy milk and milk with a higher fat content will produce more froth. Pour this into your matcha, giving it a stir or further whisk to combine. Chai is a spiced tea, usually made of a black tea base with various added spices like cinnamon, cloves, cardamom, ginger and nutmeg. It originates from India where chai means tea (masala chai means spiced tea) and traditionally Indian black teas would have been used, like Assam. Originally, masala chai was brewed directly in milk without any water added at all. This produces a very rich, spiced, aromatic yet creamy tea. 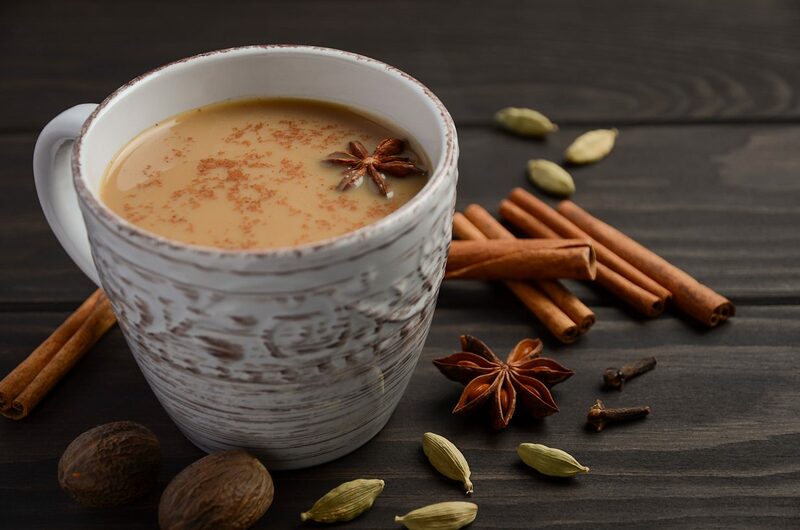 Milk, cardamom and ginger are the essentials in your masala chai. Other popular ingredients include black peppercorns, cinnamon, sugar, star anise and more. These are all spices you can find at your supermarket or already in your kitchen cupboard, so creating chai milk tea at home is very quick and easy. Use a strong black tea, like an Indian Assam or a strong Chinese Pu-er if you want to experiment. For 1 cup of masala chai, gently heat 1 cup of milk on the stove in a saucepan. Add your black tea leaves (4g per cup) and spices in a muslin bag – or simply strain the tea spices out when you pour into your cup. 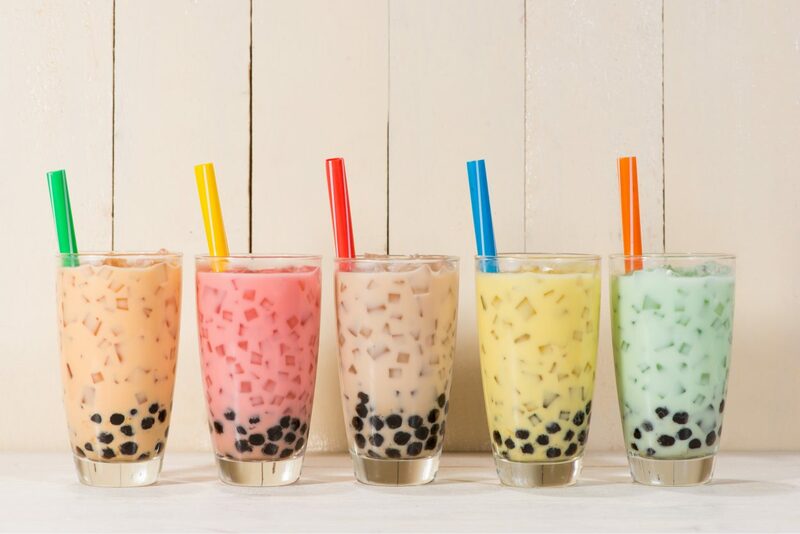 As the Taiwanese Boba tea has become more popular across the world, there are now many types of bubble teas available. Many won’t even contain tea, simply fruit flavourings, sweetened milk and flavoured pearls at the bottom. Popular flavours not included on this list are honeydew, melon, lychee, mango and strawberry. 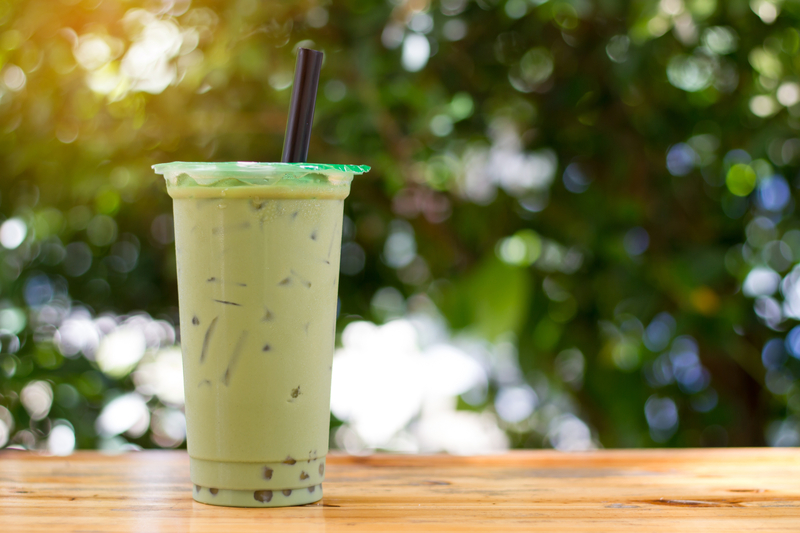 Bubble milk tea made with “popcorn tea” also known as Genmaicha, is also popular and one of the blends we think tastes divine. This green tea contains brown rice kernels, giving it a nutty, mellow warmth that works well with milk. 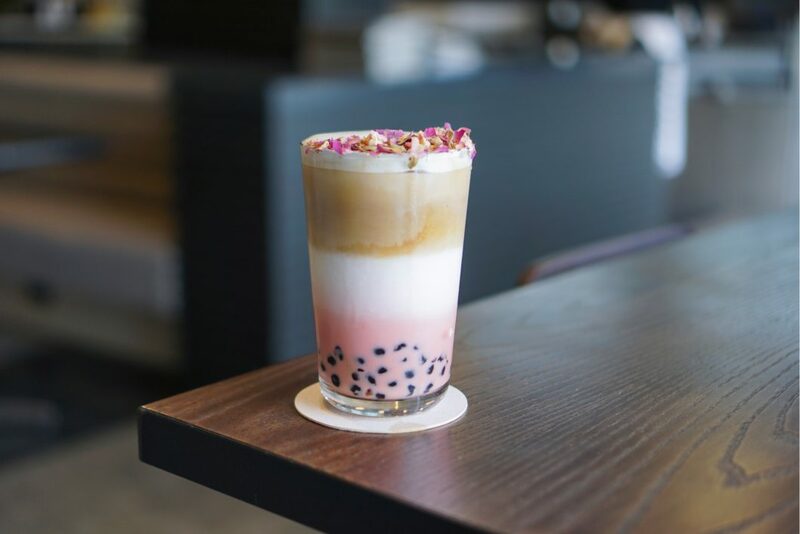 If it’s your first time adding bubbles to your milk tea, we recommend starting with classic tapioca pearls or fruit flavours you know you like! Rose is a delicate, light, floral aroma and flavour that works well with tea. Rose and black tea blends are quite popular, particularly as an afternoon tea drink. Combined with milk, it’s creamy yet refreshing with a light natural sweetness. It also goes well with fruits like tapioca so you can use your normal bubble tea pearls in your rose milk tea. Rose milk tea can be made in 2 ways. The first method involves using tea leaves (usually black or green) that are infused with rose oil or contain rose petals/buds. This gives you a very subtle rose aroma to accompany the rich black tea leaves. The second method uses rosewater syrup, which is a concentrated rose-flavoured liquid. This is much stronger and will give your tea a bright flavour – it may turn it rose-pink too. Brew your black tea, add milk, add rose essence, add bubbles if desired, and sweeten to taste. Coffee and tea together? It might sound a little strange but it’s surprisingly good. In Hong Kong, coffee milk bubble tea is called yuanyang and is quite popular. 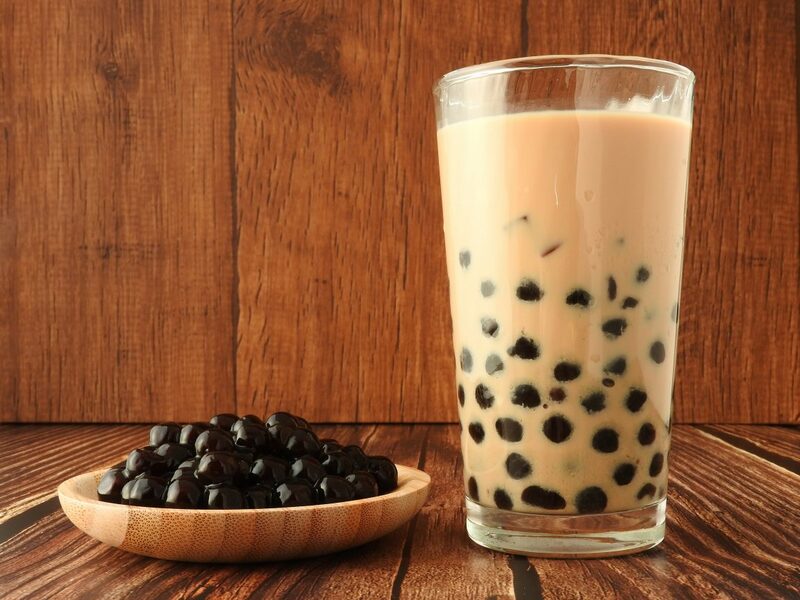 It mixes iced coffee with milk tea to create a high-caffeine drink with a creamy flavour and tapioca pearls. The result is a smooth, surprisingly light coffee-tea mix. It’s bordering on a dessert flavour and wouldn’t be bad at all with a helping of cream on top! Make up a cup equally with brewed tea and coffee, then add milk to taste. You can add some sugar or honey for sweetness. Like rose, lavender is a light, sweet floral ingredient. It works very well with dairy, creamy products (think lavender shortbread) but it’s also used a lot in soaps and bath products – too much lavender can taste soapy! English lavender is best for infusing flavour into tea. You can use the flowers and buds to brew, straining them out with the tea. The key is to use only a small amount of lavender. Infuse ½ teaspoon of lavender buds and flowers with the tea leaves or use just a drop or two of lavender essence. 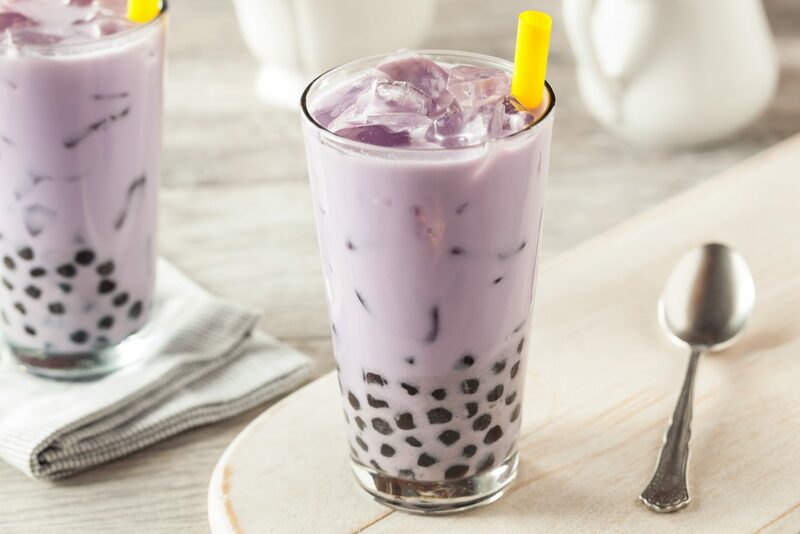 Lavender won’t naturally colour your milk tea or bubble tea so you may want to have some purple food colouring to hand if you want it to look suitably lavender. White chocolate, tea and lavender are very good together. Brew your cup of tea (chill it for iced lavender bubble tea) and either melt white chocolate into your milk or use white hot chocolate instant powder. Whisk together the chocolate milk, tea and lavender essence. Chamomile (camomile) is another floral, herby tea infusion. It goes surprisingly well with milk and cream – even more so than lavender and rose. This is because it has a very mellow, musty, honeyed hay type aroma and flavour that works so well with the richness. Chamomile milk tea with a drop of honey is heavenly. Chamomile tea is caffeine-free, so this sweet and milky drink is very soothing and sleep-inducing at night time. Chamomile is also known to have anti-anxiety properties, so enjoying a chamomile milk tea at stressful times could do you a world of good. First, infuse 4 teaspoons of dried chamomile flowers in a cup of water for 10 minutes, so it’s strong and flavourful. 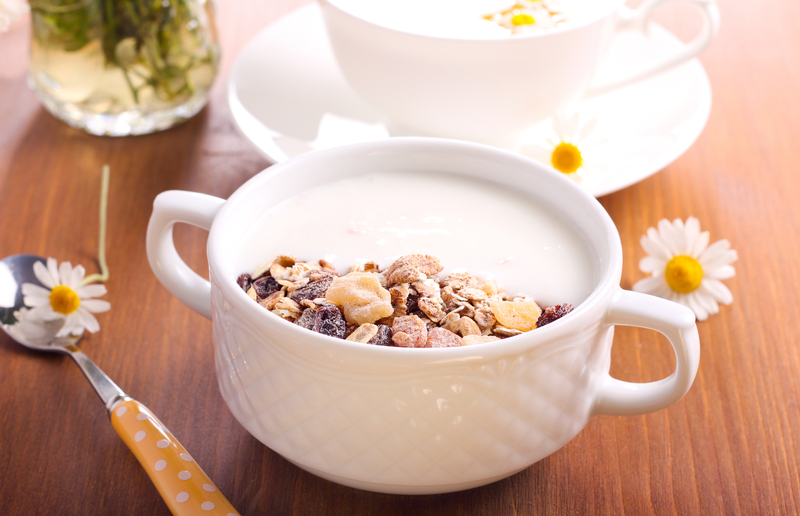 Heat your milk (about ½ a cup) and add 2 teaspoons of honey or more to taste. To turn your chamomile milk tea into a latte, whisk this milk until it’s very frothy and simply pour on top of your chamomile tea. If you’re happy with just a calming chamomile milk tea before bedtime, skip the whisking and just mix the milk with the tea and enjoy. Peach is a popular fruit to mix with green, black, white and oolong tea blends. The flavour works very well with all kinds of tea. Peach milkshakes are also popular and taste great, so combining the tea, peaches and milk together is a clear winner. This is another milk tea that goes very well with honey as a sweetener rather than sugar. It also goes well with raspberry and tapioca flavours, making this our most versatile bubble tea flavour. To make this tea you can use either: tea blends containing peach flavours, peach juice (fresh or concentrated) or fresh peach puree. The last option will give you a thicker peach smoothie-like tea. Brew your tea (black is fine, but we recommend trying a refreshing, vibrant Longjing green tea) and let it cool. Top with peach juice or flavouring, then add your milk either hot or cold. Sweeten to taste with honey and add tapioca pearls if desired. 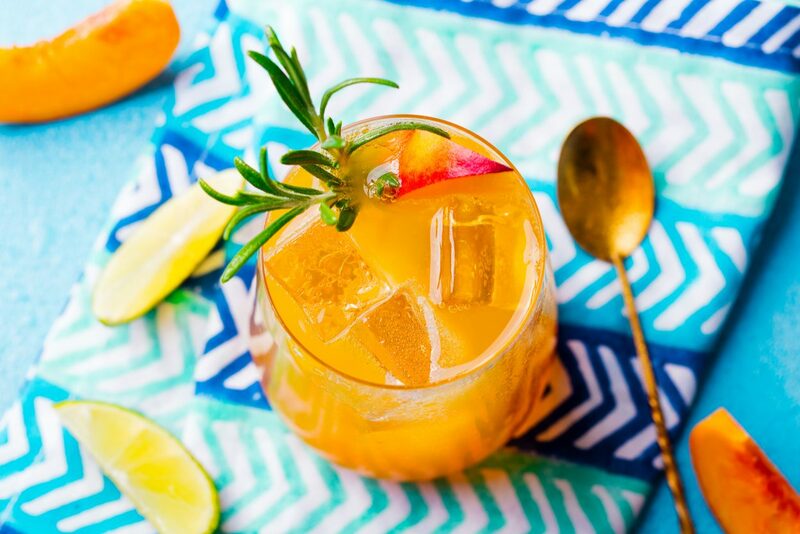 You’ll need more fresh peach juice compared to concentrated peach juice, as the flavour is fresher but weaker. Finally, we come to tapioca milk tea. If your favourite part of bubble tea is the tapioca pearls at the bottom, you’re going to love infusing tapioca into the milk tea as well. 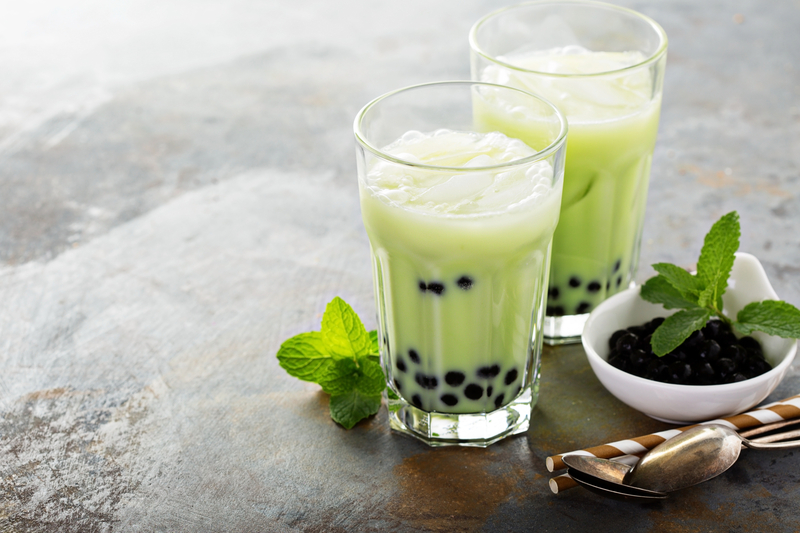 Tapioca is a starch extract with very little flavour naturally – by adding sweetener to the tapioca pearls, they add sweetness and texture to your drink. 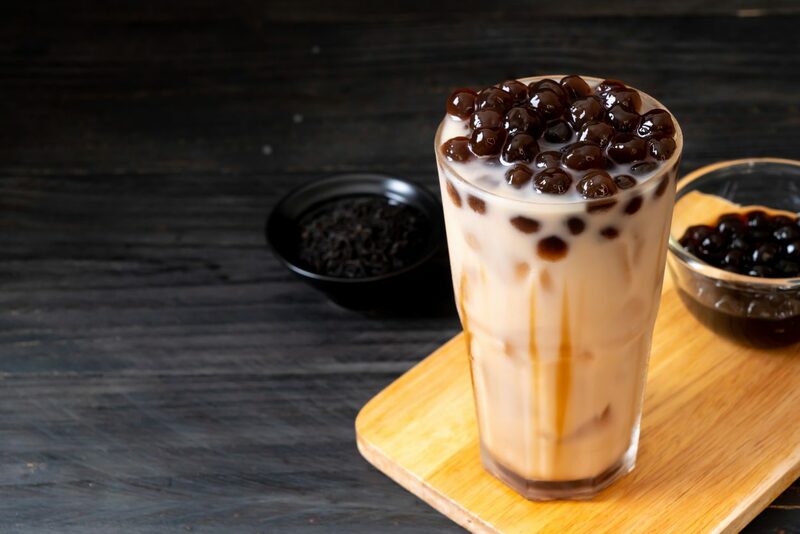 Creating a tapioca milk tea can be as simple as enjoying the tapioca pearls with plain milk or using tapioca grains to create a thicker smoothie-like dessert with tapioca pearls mixed throughout. Assam – the richness and malty flavour of this black tea goes very well with the milk. Zhuyeqing – the medium body and bright floral notes of this green tea cut through the creamy sweetness. Earl Grey – a simple Chinese black tea with bergamot creates a citrusy refreshing bubble tea. Fruity oolong teas – typically gentle and rich with stone fruit or berry flavours, we love turning our personal oolong favourites into bubble teas.